Fixed Heating Issue in Lenovo A6000 Plus, A6000 and A7000 : Lenovo mobile sales are increasing day-by-day on online store like Filpkart, Ebay, Amazon. This is because features embedded in Lenovo Smartphone series with low cost grabbed many users towards it. Lenovo A6000 was released with Android Versions Kitkat 4.4 into market. Recently Lenovo A6000 plus and Lenovo A7000 released into market with Lollipop Android Os 5.0, 5.0.1. Recent Lollipop 5.0.2 update fascinated many users. Luckily Lenovo got a feature of upgrading Android Os. On upgrading your device will be updated with Lollipop 5.0.2 Android Operating system. Awesome look and interface turned handy with upgrade, Along with these there are some issues which makes users distaste Lollipop 5.02. upgrade. How ever our staff successfully solved some of the issues like Contacts sync Issue in Whatsapp, Call Log Issue, Install Google Play store Apps issue, Third party launchers Issues.Updates : Problems after Upgrading Lenovo A6000, A6000 plus, Lenovo A7000 to Lollipop 5.0.2. In this tutorial Iam going to show How to solve Heating issue in Lenovo A6000 Plus, A6000 and A7000 . When I use net It starts to become heating. Lenovo A6000 plus become very hot even in standby mode sometimes. When I connect to charger charging doesn’t happens only battery heating is observed in Lenovo A6000+. Whatever the heating issue in Lenovo A6000 plus . One of our staff holding Lenovo A6000 plus got this problem after applying this trick. There is a relaxation with this Heating problem on Lenovo A6ooo plus . Hoping not only for Lenovo A6000 plus it might works for also Lenovo A6000, Lenovo A7000. Follow the steps carefully to fix Heating Issue in Lenovo A6000 Plus, Lenovo A6000 and Lenovo A7000. Note : Before performing below mentioned steps you are required to take “Backup of your Phone settings, Contacts to your SD card“. Click on the link to take phone backup. Soon you complete backup follow below steps. Primary step is to Switchoff your Lenovo A6000 plus Smartphone. Press volume up, volume down and Power button simultaneously (at a time). Now you can see Android booting options menu on your Lenovo A6000 plus screen. Now Move through the options by using buttons Volume up and down. Stop at “Wipe Cache Partition”. Select this option by clicking on Power button. In the same manner select “Wipe data/Factory Reset” option too. Your Lenovo A6000 or Lenovo A6000 plus smartphone will reboots now. Now go to settings and Restore all your data and contacts. After performing above steps your cache load will be cleared. 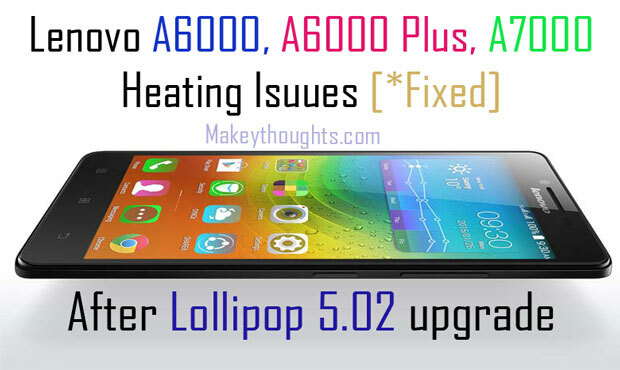 This is a small trick to Fix Heating issue in Lenovo A6000 plus smartphone get relaxation from heating problems. Still your facing heating Problem in Lenovo A6000 plus post in comment our team or our reader base will assist in Fixing heating issue in Lenovo A6000 Plus, Lenovo A6000, Lenovo A7000. hi guys after the lollipop update on my a6000 plus, I am unable to write on ext sd card with third party file managers………..in the system dialogue box to grant permission I don’t see option icon(the three dots, must b UI bug)…. I have tried factory reset . Is lenovo doing something for the problems faced after updating to lollipop (heating, fast battery draining, WhatsApp issye), in a6000plus, where can we contact lenovo for this issue. I formatted my phone including the sd card. Problem still arise. So, a6000 plus does not support such mkv format files is it so??? And is there any solution for using mkv format files without any such problems???? After restore im free free from heating problem of my a6000 plus… But I still confuse that I should update my phone to lollipop or not…. When the phone is connect to the charger,phone back portion is heated.how to solve the problem.then how to battery back up increase.then how to fast the charge. I am using my lenovo a6000 and I upgraded to lollipop 5 0 2 version, from then my phone has been changed continuously I am so upset. The major problem are.. Please give me solutions from this problem..
lollipop has some problems with lenovo mobiles …wait for new version android marshallow. then you can upgrade to new version….thanks for visiting our site…. when can we expect to resolve all this issues .. Is there any ETA date for it??? Without testing all the possible scenarios & missing the existing functionality, you are simply putting the code live which is full of bugs, worst thing from your side. You are playing with Customers concerns and Is this the way you provide services for it. Moreover the Lenovo tags line means this here ??? Not problem…best in lenovo a6000 but not show Facebook app…??? my phone is heating up so soon… and then my display is having a problem , a layer of the screen flickering on screen, its becoming faster… and when I stop using phone for 1 minute this problem is gone. but when I’m using again it starts again. what should I do? Hi, I have heating issue and my battery drained very fast. One month before I buied lenovo a6000plus. What can I do to save my battery and the heating issue. I am using lenovo a6000+ recently I puruchased in flipkart.when it locks automatically I can’t unlock it. After sometimes only I can unlock it. After that I am not getting my contacts I hav to wait for sometime. This will lead to some problem in my mobile? Please give me some solution. Hi after update, my battery is draining quickly. What should I do? my camera was not working .. when iam taking a video after complete 5 mins when iam saving the video was stucked and coming this error … Camera stopped unfortunately ……….. plzz give any solution bro.. plzzzzzzzzzzzzzzzzzzz..
my phone no 8121985401 ………………. When I upgraded my KitKat version to lollipop call log problem , phone sticks and sd card problem occurs. Hi I am using lenovo a6000 + . I have 2 sim cards I am unable to do data on off on sim card 1 . for data on off I have to go to setting plz tell why to do. Sir,when I copy and pest something in my phone the phone will heat up and draining battery very speedy. Sir my doubt is when 1st os update is systems is asking successful updated, but 2nd time this os updating is not install on my device and i give my device service center and issue will solved, but again os update message will be shows when I net connected so what I am do sir. When i Remove SD Card heating problem is resolved. After upgrading to 5.0, media volume of my lenovo A 6000 has become very low. I can hardly listen audio and videos on speaker and I always have to use earphones. Does anyone know how to fix it?? please help. 3.go to developer options- Use NuPlayer, and deselect it !!! 5. 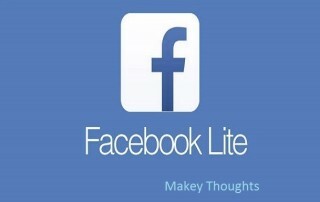 You can if want to install FB and Msg. after this. i have a lenovo a 6000 plus mobile…. i have an issue in battry…. after fully charging it may shows battery low…or battery about 50 % and all that… it is very disturbing… cant go anywhere with this…. any time it is shown as battery low… …. can i get any help ? please………. 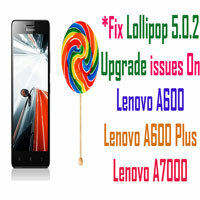 In my lenovo 6000 plus I will upgrade to lolipop version. But that time my phone is started heating issue. How will back up KitKat version. In my lenovo 6000 plus When take place in charging…mobile started heating and when removed from charging battery draining faster….what am i do. my lenevo a6000 plus phone heating today and phone was off not started. After 1,2 hours automatically low . Generely your phone is heated by more than apps. So unable the app which are not necessary. And alwas off your location moad.Because it may have very load on your phone because of finding location.Put the mobile on site in which place network are properly coming.Because if network is not coming propely mobile try and try to get netword.So it may have very load..Try it. In my Lenovo 6000 plus mobile phone I cannot go into 3G network from SIM slot 2, it got fixed and when I change the SIM into SIM slot 1 it works, but date of/on shortcut key is working then. I have to make my data off/on from sim management. How to get rid of this the problem? I have the same problem that Mr. Shri faces. Dont Play Clash of Clans Game in lenovo A6000+ It heats the phone fast. So delete the app. Hi ,Iam using Lenovo A6000+ since 1 month.iam regualry getting message ,phone is heated up,restartign in 9 seconds and is always getting rebotted..Don’t know the reason why.. Phone is always getting restarted..First time using Lenovo Very bad experience. Kindly suggest what action I need to take to solve this issue. my phone lenovo a6000+ have battery draining problem and touch not proper work and also heating issue. I have a problem in lenovo 6000 it’s seen a fix battery alarm and shown the temperature overheated phone will switch off within 10 sec. I don’t know what’s happen? Hi guys I am using Kenobi a6000+ updated my phone kitkat to lollypop working not well ..so please tell me is there any chance to get it kitkat …..
hello how are you all dear i have lenovo a6000 mob so i need its battery can any one help me please if some one want help so contact me in my num thanks 03440205152. Is any data can be loss While doing above mentioned steps? When i install lolipop the system storage device took 11 something gb from phone storage. What can i do?? i am also having the over heating problem while i use the JIO 4G sim in this phone abnormal heat was there i cant handle my phone, whether phone problem or this phone was not for jio sim. in this situation i am keeping my phone into refrigerator for 5 min to control the heat. kindly give me a good solution pls. My Lenovo a6000plus is getting heat even in stand by mode. my phone is start through another battery but when i plug my battery it is not even start my phone i change my battery it started but i tack to much heat what to do buy a Battery or another issue may be possible help me please……………..
My mobile Lenovo a6000plus is hang.when i see any video then it automatically paused while seeing video online or offline.